MIT was one of two among the ten richest universities in the nation to see a slip in its endowment last year, according to a report issued in January from the National Association of Colleges and University Business Officers. Over 1,700 graduate students and faculty have signed a petition asking MIT to improve on covering the cost of health insurance through either a subsidy or an increase in stipends. 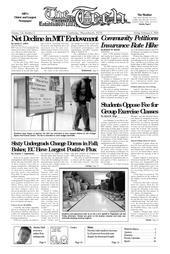 The recent postering against fee-based classes and Tuesday's letter to the editor, titled “Zesiger Center Staff: Sacrificing Community for Profits,” by Adriane Faust ’98, show that some members of the MIT community are dissatisfied with certain aspects of their experience at the Z Center. According to data from the Undergraduate Housing Office, the most popular dormitories were Baker, where only one person moved out and twelve moved in, and East Campus, where two moved out and nine moved in. The least desired dormitories were Next House and Burton-Conner, where number of residents moving out were much higher than numbers of residents moving in. Bids were offered to 122 girls at the conclusion of MIT’s sorority rush on Monday night, said Panhellenic Association vice president of recruitment Susie Lee ’05. About 200 girls registered to participate in recruitment. Of the 122 bids, 114 were accepted. As part of its commitment to transparency and accountability to the graduate student body, the GSC has compiled a mid-year review of its major accomplishments since May 2003. As the timeline below only lists the highlights of our activities, we invite you to visit our website for more information about the Council or to find out how you can get involved at http://web.mit.edu/gsc. Howard Dean: What Really Went Wrong?